A solitary figure sweated profusely as he toiled away, unconcerned by the confined space of the basement he worked in or by the wooden floorboards that formed a ceiling just a metre or so above his head. Claustrophobia, it seemed, wasn’t an issue. Stretched out full length on the concrete floor, he worked by the light of a torch he’d left resting beside him. His full attention was on filling a hole, brick by brick, in a wall that dissected one corner of the basement. It was a painstakingly slow process. He was a thinker and a planner, not a bricklayer or labourer. Even so, he understood the basics of bricklaying and he was blessed with a certain amount of natural strength, and this was helping him now. To protect his hands, he wore a pair of snug-fitting, black, leather gloves not unlike driving gloves. A little research was all it had taken to familiarise himself with the rudiments of bricklaying. The upshot was he used quick-mix cement. Three parts sand to one part masonry cement. That’s what the supplier’s instructions had stated, but he’d added an extra spadeful of cement for good measure because he felt it needed that. The instructions also advised using fine-grade masonry sand and fresh masonry cement preferably from an unopened bag. That he hadn’t managed because he didn’t want to be seen purchasing the product, and so he’d had to use what was available. And what was available was a half-used bag of course-grade masonry. Touch wood, it was doing the job – so far at least. “Mix only what you need” the instructions had read. He’d estimated half a wheelbarrow-full would do it with some to spare, so that’s the amount he’d mixed. Because of the basement’s low head-clearance, he’d had to pour the mixture into buckets – six of them – and drag them one at a time to his cramped workplace. Two extra trips had been required, including one to fetch a bucket of water. He was using the water to keep the cement from setting before applying it. The other trip had involved dragging the object he was now concealing from a room on the lower floor of the building directly above his head. That had required the most effort as the object weighed almost as much as he did. The instructions had also recommended the addition of lime to the mixture – “to bond and strengthen the stonework you are building,” according to the supplier’s instructions. He didn’t have any lime, and that had bothered him initially. Now, as he saw how well the cement was bonding with the bricks, he relaxed a little. Easy, he thought. Like falling off a bike. He was quite proud of his trowelling technique. It improved with the laying of each brick, but it was tricky and he found he had to focus. “Hold the trowel at a ninety degree angle,” he’d been advised, but he had quickly discovered ninety degrees was a bit too ambitious in the confined space. It wasn’t as if he could work standing up. Lying down, seventy degrees or thereabouts was the best he could manage with the trowel, but that was sufficient. The main challenge, he’d discovered, was ensuring the quick-mix cement in the buckets didn’t set before he could apply it. Premature setting was only avoided by regular application of water, which he dispensed by using his trowel to transfer small amounts from the water bucket to the other buckets and then giving their contents a good stir. It required some effort, and despite the basement’s cool temperature he found he was sweating more with each passing minute. Ever so gradually the hole in the brick wall grew smaller as he laid more bricks. Despite what was at stake, he worked at a leisurely pace, all the while thinking. That was something he did a lot these days. Thinking, that is. The hole was now so small he could hardly see the object he was concealing. Only the deceased’s face was visible, covered by the transparent plastic bag he’d used so effectively to cut off the other’s air supply just thirty minutes earlier. He smiled at the memory of the deceased’s final moments. Those last seconds when the young man had recognised his attacker and realised he was about to die. Oh how he loved the exhilarating, orgasmic-like feelings he’d experienced as the life of another was snuffed out. He willingly embraced them as he relived the moment. It was as if the helpless young man before him was still dying. Studying the deceased now, or what he could still see of him at least, he recalled how he’d laughed uproariously just before death came to his victim. The visuals replayed over and over in his mind. He remembered how the veins in the young man’s eyeballs, face and neck appeared to burst as he was deprived of air, and how fragile he’d looked – like a child being tortured. The icing on the cake had been when he’d used his hands to communicate a final message via sign language. He could still see the look on his victim’s face when, seconds before death came, he realised what was being communicated to him. It was a look of total horror, which was somehow more accentuated when viewed through the transparent plastic bag. That had made this killing even more satisfying. As he relived what happened, it felt like every cell in his body was jumping for joy. It was as if his very DNA had been created for one purpose and one purpose only: to kill. He had been planning the murder these past six months. In fact, he’d first thought of killing him years ago, but it required time for those thoughts to solidify into a plan – a concrete plan in more ways than one. Now that he’d acted, he wondered why it had taken him so long. It wasn’t as if he was afraid or anything like that. He’d delayed because he couldn’t decide exactly how he wanted the young man to die. Bludgeoning, shooting, stabbing, poisoning, gassing, drowning had all been considered. Finally, he’d opted for suffocation. Why? He couldn’t really say. Certainly he wanted to watch him suffer. And he wanted to prolong his suffering. But stabbing or poisoning or any number of methodologies could have achieved that. Looking at him now, the killer knew he’d made the right decision. The deceased’s tortured face seemed distorted inside the plastic bag that covered his head, and his sightless eyes still registered the intense fear he’d experienced in his final ghastly moments. Studying him in the torchlight, he felt his manhood hardening beneath him. He removed one of his gloves then, raising his pelvis off the floor, he reached down and began pleasuring himself, all the while looking at his victim. Satisfaction arrived quickly and he groaned as he came. Recovering his composure, he donned his glove and resumed working. It wasn’t long before the hole was completely bricked over. He shone his torch on the wall and inspected his handiwork. The newly laid bricks aligned flawlessly with the older bricks. That was no accident because he’d used identical surplus bricks the building’s owner had thoughtfully left in the basement. Finally, he cleaned up, removed his gloves and then began crawling back the way he’d come, taking his buckets and work tools with him. As he departed, he knew he’d need to kill again. And soon. He had to experience those wonderful feelings again. He was confident he wouldn’t have long to wait; his master plan was already in motion. Want to read more? 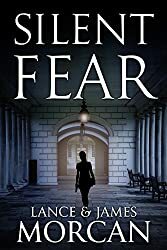 The Silent Fear paperback is available now via Amazon; the Kindle ebook can be pre-ordered now and will be auto-delivered to your Kindle on October 31. Silent Fear, which is set in a university for the deaf in London, is dedicated to the many millions of deaf people around the world.